The VIPER is designed to be the most affordable, high quality night vision system on the market for short-range distances. With an identification range of up to 100 meters (110 yards), the viper is perfect for the up-close and personal hunter. The 60 second add-on to your existing day scope makes the conversion to night vision hunting easier than it ever has been. This is not reflected in the photos as the photos are generalised product images direct from NiteSite. Designed to be the most affordable, high quality night vision system on the market for short-range distances. The VIPER is perfect for the up-close and personal hunter. NITESITE VIPER is the perfect night vision unit for any hunter, delivering high quality, clear night vision through any day vision rifle scope. Using 850nm infrared illumination (invisible to people and animals) to literally illuminate the target area immediately in front of where the rifle scope is aiming, allowing clear target identification up to 100 metres (110 Yards) away. 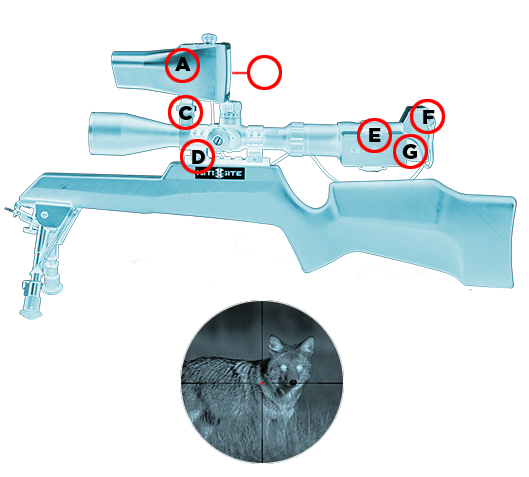 The infrared image is then captured through the rifle scope by a camera attached to the scopes eyepiece and then viewed via the units integral 3.5 inch LCD screen.